We know you’re hungry for more details about the upcoming Parkade Party, and we’re happy to share more with you today! The main event that evening will commence at sundown (around 9pm) – an outdoor screening of the iconic 50s musical, Grease! You may have seen the John Travolta and Olivia Newton-John vehicle many times before, but never like this – on a rooftop parkade in downtown Edmonton! To get you in the mood, we’ve also partnered with Sugar Swing Dance Club, Edmonton’s premiere swing dance company that promotes a fun learning environment for all ages! Sugar Swing representatives will be on hand prior to the movie to teach Grease-inspired dance moves. Ever wanted to “Go Grease Lighting” like the T-Birds, or “Hand Jive” with the best of them? Now’s your chance! So wear your dancing shoes, bring your lawn chair and cozy up for a movie classic where you’ve never seen it before! 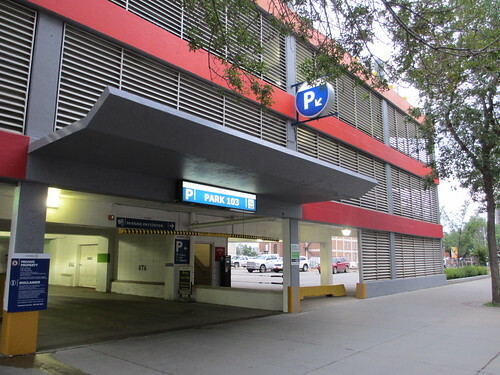 Save the date for our Parkade Party: August 31, 2013! This summer Blink is expanding beyond pop-up restaurants. We’re very excited to announce a new event coming at the end of the month – Blink: Parkade Party! Join us as we transform a parkade rooftop into a pop-up, temporary park. With food, entertainment, and a unique view of downtown Edmonton, you won’t want to miss this party. Admission is free, but we will be accepting cash donations to support Downtown Proud, a program run by Boyle Street Community Services. The entertainment line-up will be announced in the coming weeks, but for now we’re excited to share with you our dining options. Fat Franks and Cookie Love will be serving up your carnival favorites! Please RSVP on Facebook so we can get a sense of numbers. See you there! See if your friends are coming! Check out the event on Facebook.